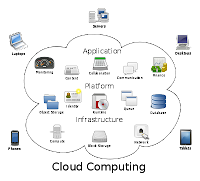 Infrastructure-as-a-service (IaaS), Platform-as-a-service(PaaS) and Software as-a-service (SaaS) the name cloud computing was inspired by he cloud symbol that's often used to represent the internet in flow chart and diagrams. A cloud service has three distinct characteristic that differentiate it from traditional hosting. 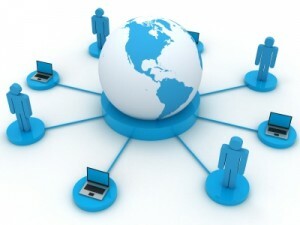 It is sold on demand typically by the minute or the hour it is elastic a user can have as much as a little of a service as they want at any given time and the service is fully manage by the provider(the consumer needs nothing but a personal computer and internet access. Significant innovation is visualisation and distributor computing,as well as improved access to high speed internet and awake economy, have accelerated interest in cloud computing. A cloud can be private or public. A public cloud sells service to any one in internet. (Currently, Amazon web service is the largest public cloud provider). A private cloud is a proprietary network or a data centre that supply hosted service to a limited number of people.When a service provider use public cloud recourse to create their private cloud, the result is called a virtual private cloud.Private or public the goal of cloud computing is to provide easy, scalable access to computing resources and it services. Infrastructure-as-a-service like Amazon web services provide virtual server instance to start,stop,access and configure there virtual server and storage. In the inter price, cloud computing allows a company to pay for only as much capacity as much needed and bring more on line as soon as required. Because this pay-for-whatyou-use model resembles the way electricity, fuel and water are consumed. It's sometimes refered as utility computing. Platform-as-a-service in the cloud is define as a set of software and product development tools hosted on the provider's infrastructure.Developers create applications on the provider's platform over the internet. PasS PROVIDERS may use APIs, websites portals or gateway software installed on customer's computer. Fore.com, (an out growth of sales force.com) and goggle apps are example of pass.Developers need to know that currently ,there are not standard for interoperability or data portability in the cloud. Some providers will not allowed software created by their customer to be moved off the provider's platform. In the software-as-a-service cloud model, the vendor supplies the hardware infrastructure the software product and interacts with the user through a front and portal. SaaS is a very broad market. Services can be any thing from web base email to inventory control and data base processing. Because the service provider hosts both the application and the data, the end user is free to use the service from any where.